Dicke & Partner overstripped its competitors in the Promotional Gift Award 2017 with a winged rhinoceros and was rewarded with a distinction in the category Best Practice: Alex aims to cheer up children in hospitals and help them combat their fears as well as learn more about their illness and the respective treatment. 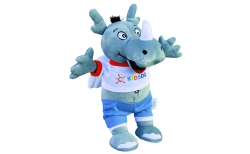 The rhinoceros is the hero in three stories, which are distributed to the young patients as a small booklet, as well as being available as a cuddly toy. Ten Euros are paid for two Alex toys, but in fact the second toy goes to a child in the clinic, if it has been brave for instance and cooperated well during the treatment. Furthermore, as a loveable communicative character, Alex also strives to find sponsors and donors, who support the Westphalian Children’s Centre. Indeed, the project is turning out to be a sure-fire success because as the unofficial mascot of the city of Dortmund, the winged rhino is achieving a high recognition level and is encouraging regional social commitment. For example, the fan sector of the football club, BVB, is cladding out Alex with black and yellow accessories in the scope of the “Rhino Project“ and selling him via its own online shop. Alex is also supposed to be on board during the coming Eurovision Song Contest in Kiev.